Boil the edamame pods in salted water until it gets tender. Drain. Squeeze the pods to get the beans. reserve. Mix the tsuyu sauce, yuzu sauce and water. Reserve. Cook the cha soba until al dente. Drain. 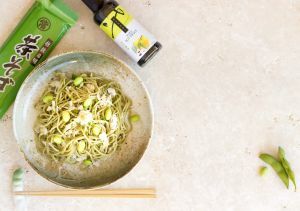 In a large bowl, combine the noodles, edamame, crab meet and the mix of tsuyu / yuzu sauce.